This is a very special Limited Edition run of which only 250 instruments were produced. It's a note- perfect replica of the 1961 Tele® that Summers used to help propel the Police to untold heights of worldwide pop superstardom. Featuring the ferocious humbucking neck pickup and single coil bridge pickup mounted in the body rather than in the broken brass (not chrome) bridge plate; a control plate-mounted mini-toggle phase switch; body-mounted preamp on/off mini-toggle switch (the Custom Shop has recreated the Police- era preamp); the rear-mounted overdrive unit controlled by a third knob below the two traditional Telecaster volume and tone controls; "soft" brass bridge pieces and Schaller® tuners. We think you should have a Special Licence to play this one. What a great guitar! Complete with Case Candy & Flight Case. 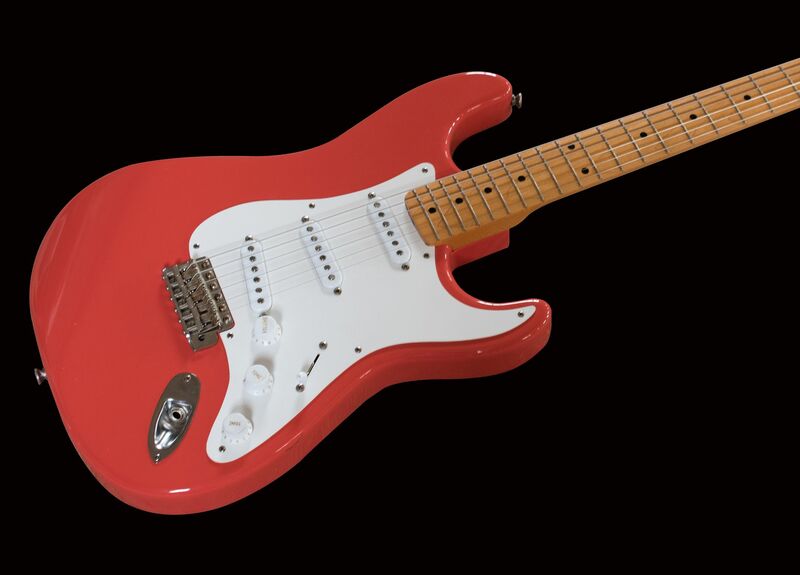 Fender Stratocaster 1954/55 Replica (54 Body, 55 Neck) Fiesta Red with Nickel fittings. Completely hand-made instrument made from the finest materials with a cell finish Hand- made Bridge & Saddles. Custom made Pickups. Large neck profile. Also available in Two- Tone Sunburst. VERY RARE FIND! 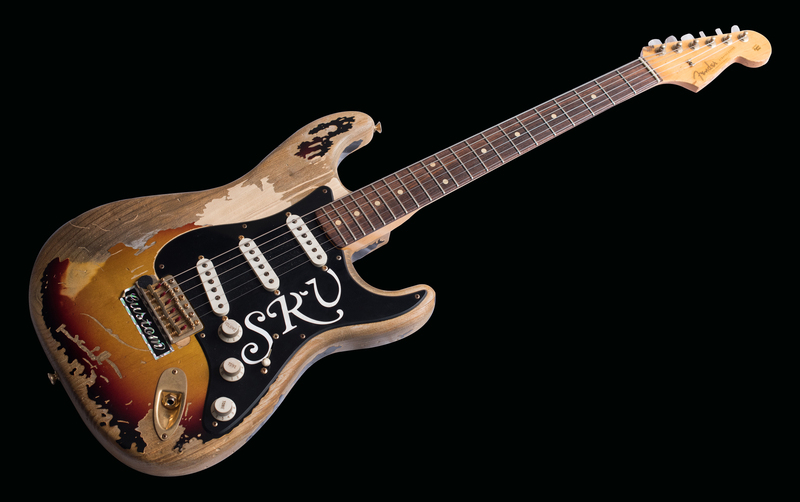 In 2003 the Fender Custom Shop got together with the Vaughan family to recreate the main axe of Stevie Ray Vaughan and offer it in very Limited numbers. Only 100 were made by Master Builder John Cruz. These guitars evaporated into collections very quickly and this is a rare chance to purchase one for yourself. We challenge you to FIND ANOTHER!!! This is a great example complete with Case Candy and the HSC. An investment for the future. 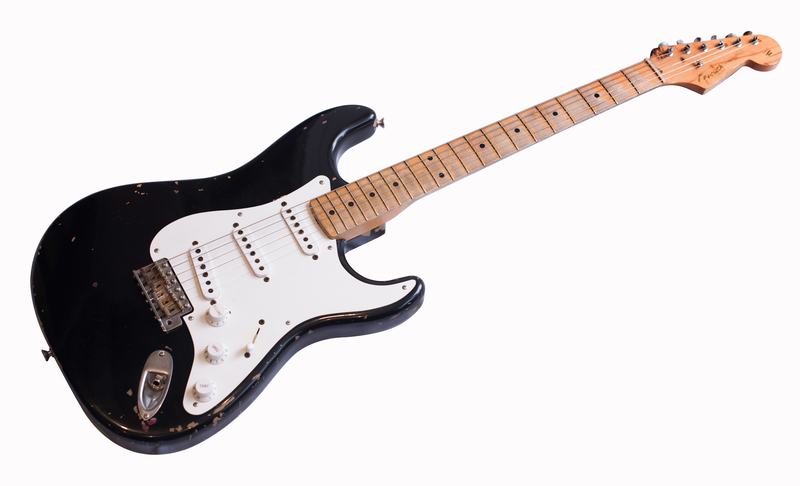 Limited Edition - Highly collectible - Investment grade instrument Exact Replica of Eric Clapton’s original Blackie Strat This guitar hardly needs an introduction. Eric Clapton’s original Blackie Stratocaster is well known among guitar aficionados as one of the world’s most iconic musical instruments. It is also well known for selling at auction for over $950,000, raising money for Eric Clapton’s Crossroads Rehabilitation Centre in Antigua. This guitar is just in on consignment and has been collector owned and cared for. No serious issues, repairs, etc… Comes with the original Flight Case which is a replica of the actual “Duck Bros” case that the real Blackie came with as well as some accessories and collateral that is pictured (certificate of authenticity). Like all our used / vintage gear it has been tested for functionality and priced to move. Sold as- is. What you see is what you get. In the late '60s, Eric Clapton personally combined the best elements of three vintage Stratocaster guitars to create the original Blackie, which now bears the battle scars of decades of touring, jamming, recording and songwriting. In 2004, Eric generously offered Blackie for auction to benefit the Crossroads Centre, Antigua. On June 24, what was already the most famous guitar in the world also became the most valuable. The winning bid was $959,000! Blackie then traveled to the Fender Custom Shop in Corona, CA USA, where it was carefully analyzed and meticulously measured to capture every essence of its unique character. 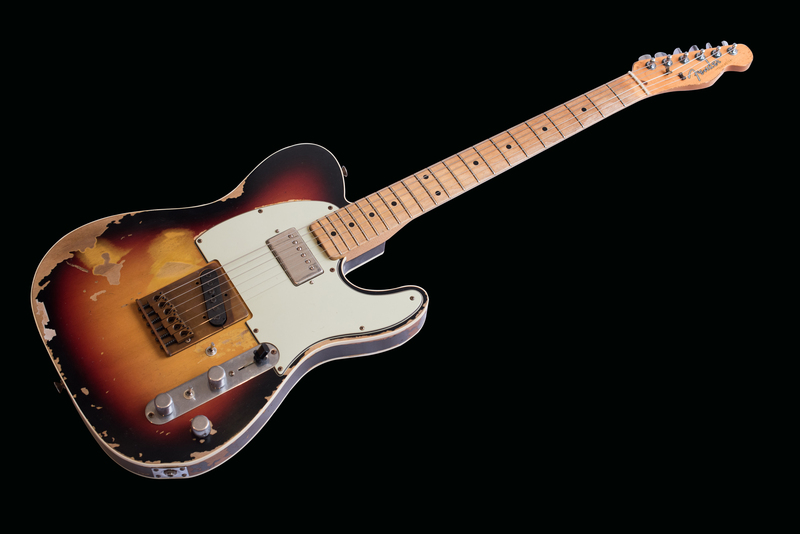 This legendary instrument has now been painstakingly re-created by the Fender Custom Shop. Right down to the last authentic detail. From the worn-to-the-wood body, to the neck re-shaped by Eric's hand as he played a thousand heartfelt solos. From the unmistakable cigarette burns on the headstock, to the world-weary flight case – every historical detail is faithfully re-created. All the parts, pickups and electronics are aged and matched to the original, unique specifications of Blackie. This is one of only 185 guitars originally produced for the US Market. 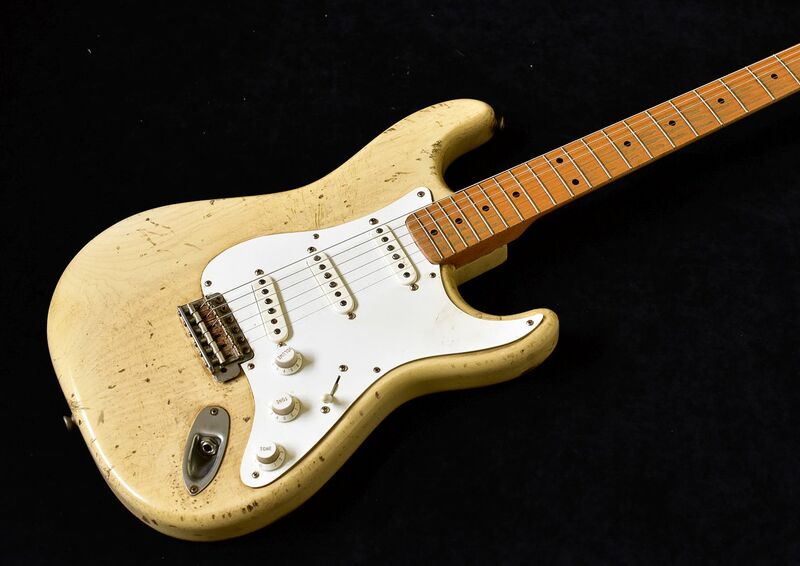 It is serial number and was Masterbuilt by Mark Kendrick, one of Fender’s most senior Master Builders. Complete with all paperwork and original HSC. Fender Stratocaster 1963 ‘Live Aid, Signed’ £Offers??? Now here is a Rare Find! 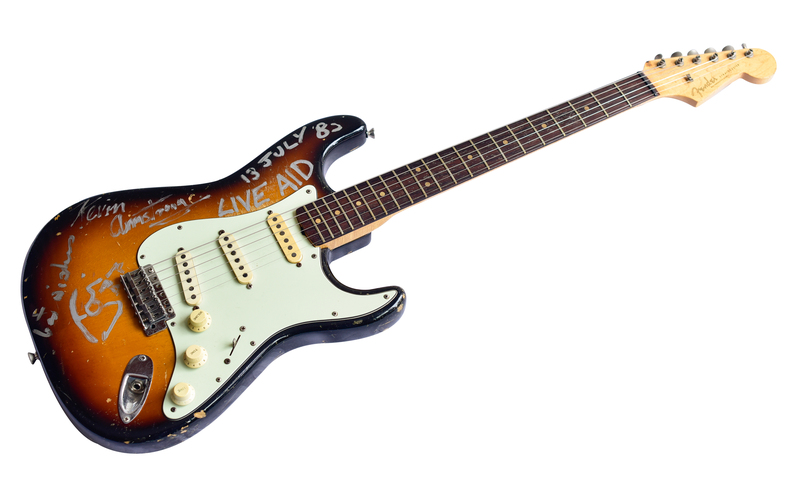 This is the Fender Stratocaster, made in 1963, which was signed by none other than David Bowie and his sometime guitarist / producer Kevin Armstrong at the Live Aid concert on 13th July 1985. Make us an offer!!! 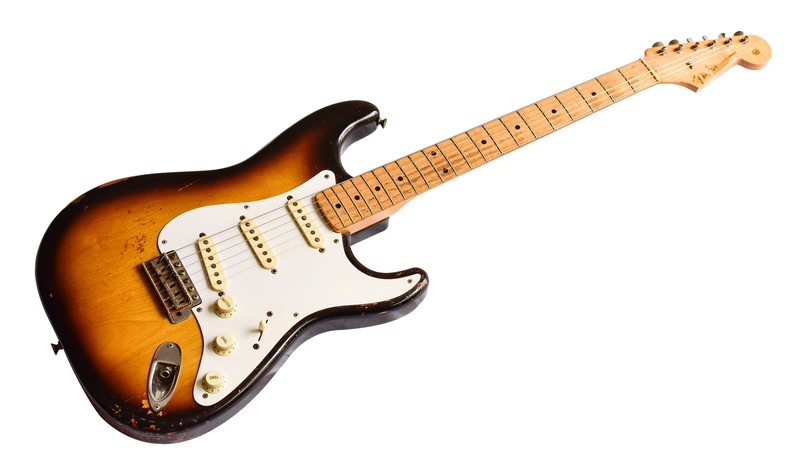 Original Fender Stratocaster made in 1957 Two Tone Sunburst Finish, V neck profile. A real players guitar, all original parts and finish. Complete with the OHSC. White Rosewood board, used, all original parts and finish. Complete with the original HSC. Short scale Maple neck, a rare find in the UK. Original Desert Sand finish, many replaced fittings. Complete with OHSC. Limited Edition - Highly collectible - Investment grade instrument Exact Replica of Eric Clapton’s original Blackie Strat This guitar hardly needs an introduction. Eric Clapton’s original Blackie Stratocaster is well known among guitar aficionados as one of the world’s most iconic musical instruments. It is also well known for selling at auction for over $950,000, raising money for Eric Clapton’s Crossroads Rehabilitation Centre in Antigua. This guitar is just in on consignment and has been collector owned and cared for. No serious issues, repairs, etc… Comes with the original Flight Case which is a replica of the actual “Duck Bros” case that the real Blackie came with as well as some accessories and collateral that is pictured (certificate of authenticity). Like all our used / vintage gear it has been tested for functionality and priced to move. Sold as-is. What you see is what you get. In the late '60s, Eric Clapton personally combined the best elements of three vintage Stratocaster guitars to create the original Blackie, which now bears the battle scars of decades of touring, jamming, recording and songwriting. In 2004, Eric generously offered Blackie for auction to benefit the Crossroads Centre, Antigua. On June 24, what was already the most famous guitar in the world also became the most valuable. The winning bid was $959,000! Blackie then traveled to the Fender Custom Shop in Corona, CA USA, where it was carefully analyzed and meticulously measured to capture every essence of its unique character. 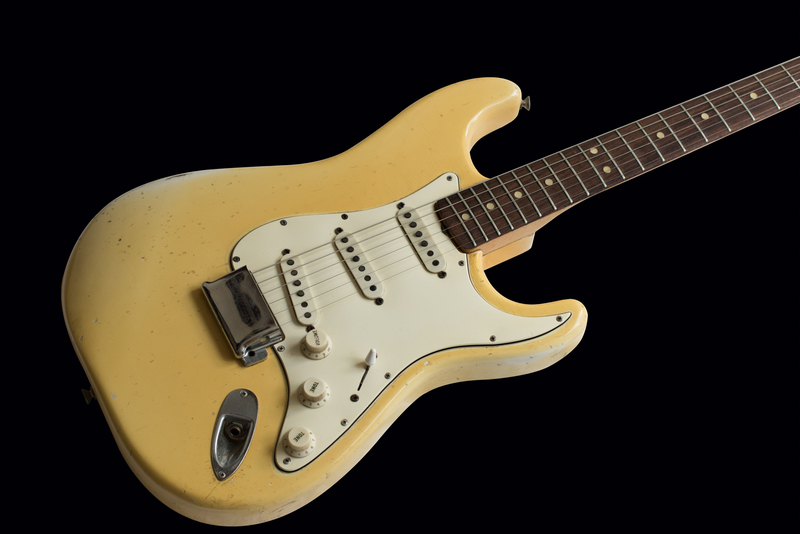 This legendary instrument has now been painstakingly re-created by the Fender Custom Shop. Right down to the last authentic detail. From the worn-to-the-wood body, to the neck re-shaped by Eric's hand as he played a thousand heartfelt solos. From the unmistakable cigarette burns on the headstock, to the world- weary flight case – every historical detail is faithfully re-created. All the parts, pickups and electronics are aged and matched to the original, unique specifications of Blackie. This is one of only 185 guitars originally produced for the US Market. It is serial number and was Masterbuilt by Mark Kendrick, one of Fender’s most senior Master Builders. Complete with all paperwork and original HSC. Fender Stratocaster 1954/55 Replica (54 Body, 55 Neck) Fiesta Red with Nickel fittings. Completely hand-made instrument made from the finest materials with a cell finish Hand-made Bridge & Saddles. Custom made Pickups. Large neck profile. Also available in Two-Tone Sunburst. This is a very special Limited Edition run of which only 250 instruments were produced. It's a note-perfect replica of the 1961 Tele® that Summers used to help propel the Police to untold heights of worldwide pop superstardom. Featuring the ferocious humbucking neck pickup and single coil bridge pickup mounted in the body rather than in the broken brass (not chrome) bridge plate; a control plate- mounted mini-toggle phase switch; body-mounted preamp on/off mini-toggle switch (the Custom Shop has recreated the Police-era preamp); the rear-mounted overdrive unit controlled by a third knob below the two traditional Telecaster volume and tone controls; "soft" brass bridge pieces and Schaller® tuners. We think you should have a Special Licence to play this one. What a great guitar! Complete with Case Candy & Flight Case.